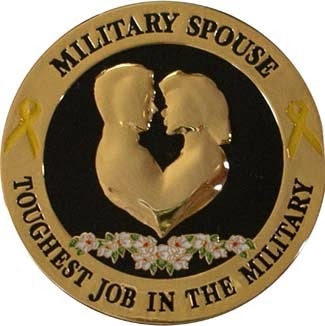 In the military the Service Member’s significant other is known as a "Milso," or Military spouse. In Freemasonry, these women are known as Mason’s Ladies. Both these types of women play crucial roles in the development and support system of the Mason or Service Member. Without these women it is impossible for a Soldier/Airmen/Marine/Seaman to feel that sense of belonging and security while serving their country. A spouse's role is just as important to a Mason as if he were in the Military. When a Soldier/Airmen/Marine/Seamen deploys he must have the support system his significant other provides back home to secure his mind while overseas. She typically takes care of all the family issues, bills, food, and lives the life of a single mother even though she is married. She is expected to take on the role of both parent figures and is understanding when her man in uniform answers the call to serve his country. There are a number of running derogatory jokes involving Military Spouses, one in particular mentions how the Military Spouse takes the backseat to the Country at all times. However, this may seem true, it could not be more false. If the Non-Commissioned Officers Corps is the backbone of the Army, those in the “Silent Ranks” are the heart. Just the same as a Military Spouse must understand— a Mason’s lady must understand when her Master Mason must attend lodge. It is known that Freemasonry will never come in conflict with obligations with career, deity or family. However, some Master Masons dedicate a lot of time to the Craft. It is not to take away from those who cannot, instead, a way for that particular Master Mason to fulfill their personal journey. A Mason’s lady is supportive of her husband’s laudable pursuits. If he finds interest in writing and writes about the Craft, she will support his endeavors. That doesn't mean she has to read every article he publishes or attend every dinner, but simply lets him know she admires his efforts. When a Brother is asked to travel and speak at another lodge, she may or may not go with her husband. That is ultimately her decision, but it makes things more enjoyable for a brother to be accompanied by his wife. If she does not travel with the brother, it may be for the purpose of work, children and the same duties a military spouse will have to accomplish when a Soldier is deployed. None-the-less, it is always nice to see a brother accompanied by his companion. This is the first time I've seen anything like this. It will find its way into my Lodge. Thank you Brother Aaron, very well said.